Mom and I had decided to take a short trip to northern California to watch the Tour of California cycling race and go to Lake Tahoe. We flew from Birmingham to Sacramento arriving this afternoon. 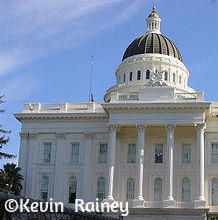 The prologue stage was a short time trail taking place today near the capitol building in Sacramento. Our plan was to travel to watch Stage 1 tomorrow in Santa Rosa. After picking up our rental car at the airport, we took I-80 east passing through Davis before taking Highway 29 through Vallejo, Highway 37 north of San Pablo Bay, and exiting on Highway 101 north to Santa Rosa. We checked into the Courtyard by Marriott in Santa Rosa before going to dinner at Chevy’s nearby. It’s always one of my favorite Tex-Mex restaurants! We saw organizers had already put the finish banner and barricades up downtown for the final stretch of Stage 1. As a cycling fan, this is exciting! They wanted to make a splash for local cycling hero, Levi Leipheimer, two-time TOC Champion who would be racing into town as a favorite to also win this year race after a terrific last year that saw him finish second at the Vuelta a España. 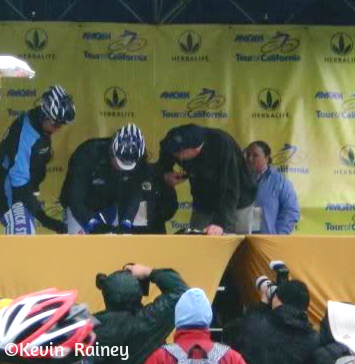 Lance Armstrong was also creating a media circus with his comeback but would be racing for Levi. I’m not much of an Armstrong fan because I think he is a cheater, but at least he brings fans and money to the sport. We returned to the hotel after walking the pretty streets of Santa Rosa. Then we went to bed because we have a busy day on Sunday. This morning when Mom and I woke up, the weather forecast was looking ominous. The weather called for a blizzard picking up later during the day in the high Sierras. Instead of waiting to watch the finish in Santa Rosa, we knew we had to leave for Lake Tahoe earlier if he we had any hope of making it there. We decided to drive to Davis to watch the start and then head towards Tahoe. We headed east to Davis and parked on the UC-Davis campus and walked to the starting line in town. 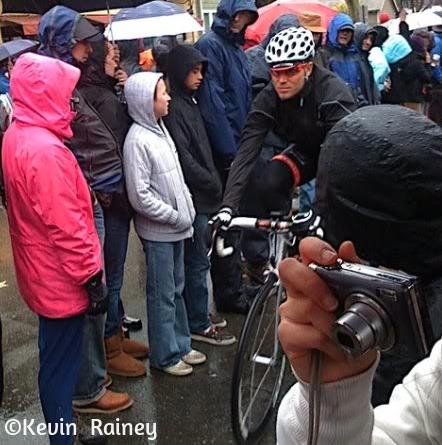 We watched the racers sign in as Dave Towle, the voice of Ironman, interviewed the cyclists. They were all donned in their rain jackets, shoe covers and caps under their helmets. The gun sounded and they were off! So cool to see many of these famous North American, European, Australian and South American athletes live in person instead of on television. After the start, we left for the Sierras. The winds were blowing hard in the Sacramento Valley at 50-60 mph and were really pushing our SUV around. We stopped for lunch at In-N-Out Burger in Auburn, which was our first time ever at the West Coast burger institution. The fresh made fries and burgers were out-of-this-world good! Truly the best burger I have ever tasted. With our stomachs full, we hopped back on I-80 East. As we climbed into the mountains, the rain soon urned into snow. By the time we reached Applegate (Exit 128), all 18-wheelers were being stopped for mandatory chains and CalTrans had issued a Requirement Two snow chain designation meaning chains were required on all vehicles except four-wheel drive or AWD vehicles. There was a huge army of private contractors that had assembled to fix chains to vehicles. Mom and I were a little worried that we would make it, but traffic was moving slow but steady. A blizzard warning had been issued and the snow was poring down. Donner Pass, at over 7,000 feet, had a nasty reputation for foul weather dating back all the way to the 1800s with early emigrants on the California Trail and construction of the transcontinental railroad. In fact, the pass is one of the snowiest places in nation receiving an average of more than 410 inches of snow per year! It is not uncommon for wind gusts to top 100 mph in some storms through the pass! Fortunately I-80 is more gradual from the west, but I was little more anxious about the steeper east side of the pass. However, after we reached Emigrant Gap, I started to feel confident we could make it. After reaching Donner Summit and starting our slow descent in the wall of traffic, we finally felt like we would reach Reno. After passing the Truckee exit, the snow slowed a little. When we reached Verdi in Nevada, the roads were much better but still snowy. We had made it to Reno! Upon arrival in Reno, we exhaled as we pulled into Harrah’s Reno. Mom and I had some Asian food in the hotel’s Joy Luck Noodle Bar. I had some really good Chinese and Thai food. The pot stickers, mandarin chicken and Pad Thai were all very good. Then Mom and I hit the slots. That evening we watched the weather carefully planning our journey for Monday down to Lake Tahoe. I was off today for President’s Day and had a carry-over holiday from 2008 for Tuesday, so I was only killing one vacation day on this trip. Jeff and I were trying to save days for a trip to Australia in July. So I was really crossing my fingers that I could ski this weekend for my one ski trip this year. After breakfast, Mom and I took I-580 South to I-395 South to Carson City, where we stopped for lunch. 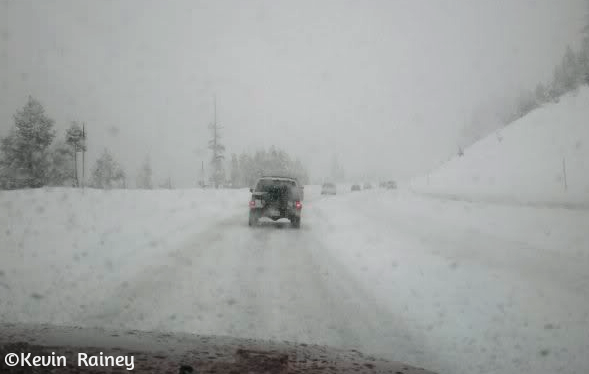 We then gingerly took Highway 50 west up a snowy Spooner Summit. As we descended Montreal Canyon, the beautiful blue of Lake Tahoe came into view below us. It always gives me goosebumps to see the azure colored lake, especially surround by the Sierra peaks covered under a fresh layer of powder. We passed through a tunnel and by lovely Caver Rock Park boat dock, where we have stopped for many photos before. Upon arrival at Harvey’s in South Lake Tahoe, we checked into the hotel. I changed into my ski clothes, and said goodbye to Mom. I walked a couple of blocks down across the California state line to Heavenly Ski Resort and bought my ski pass before renting my skis, boots and poles. The lift was just opening around 11 a.m. because of high winds earlier. I got on the gondola to base camp. I then skied the rest of the day in fresh powder on both the California and Nevada sides. That evening, I came to the casino and Mom and I went to eat at the Sage Room steakhouse on the top floor of the hotel. Then we went gambling for a little while before calling it a night. As a skier, I promise you cannot find a more entertaining place on the planet than Lake Tahoe in the wintertime! This morning I decided to go skiing on the north side of the lake at Northstar. I hadn’t been there since I was a kid, and it was where I first learned how to ski. Because Highway 89 was closed on the west side of Lake Tahoe, I had to take Highway 50 and Highway 28 up the east side of the lake. I took Highway 267 north from Kings Beach to Northstar. 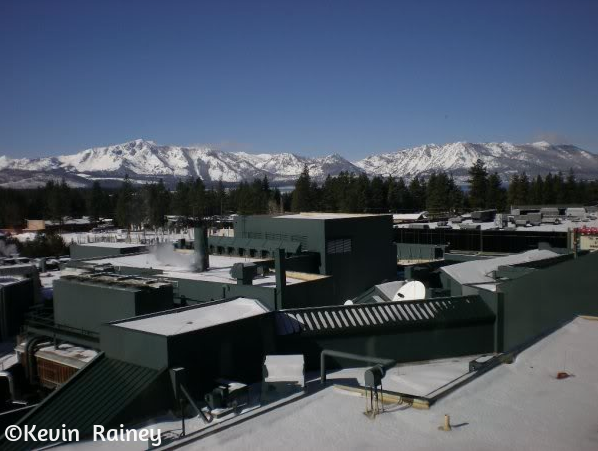 I was amazed at how much the resort had changed since the days went it was known as Northstar-at-Tahoe! 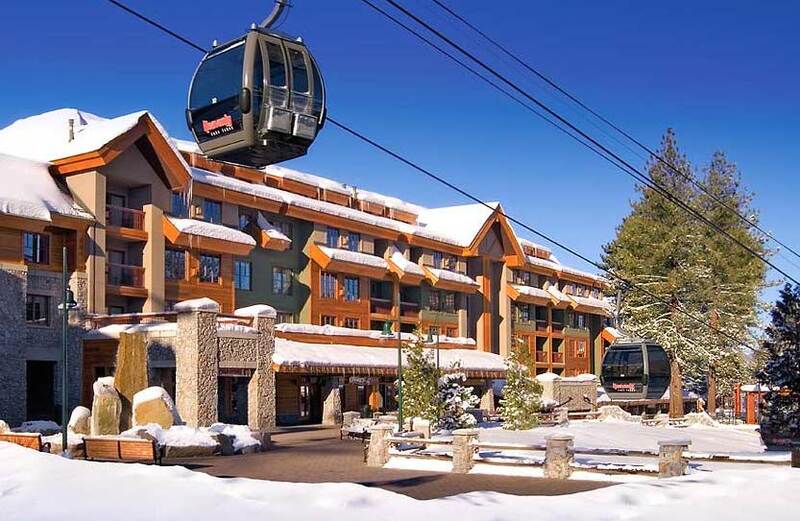 The resort was now owned by Vail Resorts, which owned Heavenly and Kirkwood along with Vail, Breckenridge, Keystone, and Beaver Creek in Colorado. 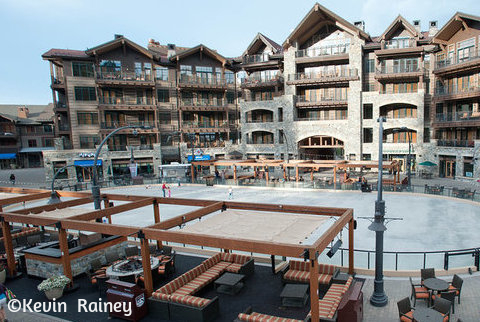 They had added the Village at Northstar complete with a 9,000 square foot ice rink, dining, entertainment and shopping! After a full day of skiing, I had to try out the rink that evening! They had also added the Northstar Lodge, a Hyatt Residence Club and were building a Ritz-Carlton to be completed later in the year! After the drive back to the casino, I met up with Mom at the room. She had already eaten dinner, so I went downstairs to grab a meal in the food court of the casino. Another spectacular day at Lake Tahoe! This has been an awesome trip, but the roads were still very snowy. Mom insisted that we allow plenty of time to get out of Tahoe and over I-80, so we left early for our afternoon flight. 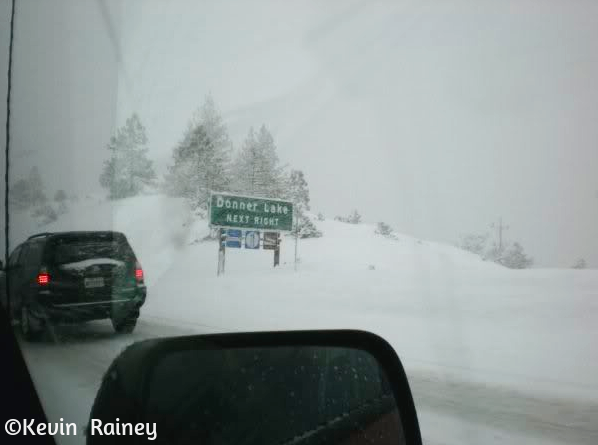 After some cautious driving and deep snow, we made it over Donner Pass! We turned our car in at Sacramento airport and grabbed lunch in the terminal. It was a great short trip, and we couldn’t wait to return to Lake Tahoe again!